Find lots of inspiration for Pisces tattoos right here. If ever there was a zodiac sign that was meant to wear its heart on its sleeve, or in this case "arm", it's Pisces. People born under this sign (February 19-March 20) are the dreamers and do-gooders of the Zodiac, and their caring nature is without question. Yet there is an aura of mystery about this sign, probably due to its dual nature. You may know a Piscean on the surface, but it's difficult to gauge those still waters that run below the surface.Pisceans are also quite artistic, so it's not unusual that we find more than a few tattoo enthusiasts amongst this particular sign's members. With this in mind, let's gather ideas we can use to inspire some awesome Pisces tattoos. If you take time to examine the individual attributes of Pisces, you'll find there is plenty of material to draw on when creating an original design. There is no stronger symbol to represent that dual nature we spoke of earlier than Pisces' fish sign. Here we find two fish swimming in opposite directions, yet attached by a thin cord. Being torn in two directions: Pisces can choose to go with the flow or swim against the current, and sometimes it's difficult to know which direction to take. Do you feel pulled in opposite directions? Maybe the fish would be the right tattoo choice for you. Yin and Yang: More than any other zodiac sign, Pisces' fish are the perfect subject for a customized Yin Yang tattoo. You can tailor your fish into the light and dark powers of a completely symbiotic relationship. Religious symbolism: Fish do have a strong connection with Christian symbolism. Perhaps you want to express yourself with a tat design of this nature. If so, you might want to trade in a more ornate design for a pair of simple Christian fish outlines. 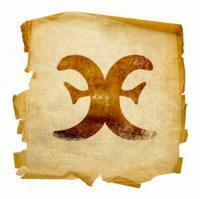 Pisces' glyph symbol is really quite simple, but it still makes a good basis for a tattoo. Imagine a set of parenthesis facing away from each other, but connected through the middle by a single thin line. This tat looks particularly great when worn on the shoulder or ankle, but you can have it inked just about anywhere you choose. Neptune is the ruling planet of this zodiac sign, so you could choose to use it in a number of ways for Pisces tattoos. The planet itself is less distinctive than other planets such as Saturn or Mars, but you could color your Heavenly body any way you wish, ring the outside of the planet with a repetition of its name, and add a small set of fish in the center. If you haven't already guessed it, Pisces is a water sign, so adding water elements to your design is not only permissible, it's highly encouraged. 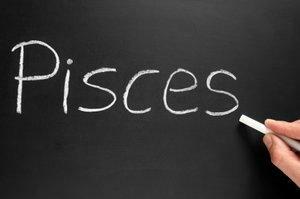 Pisces rules the twelfth house, the house of the subconscious. In keeping with Pisces' somewhat secretive nature, perhaps you'd like to create a tattoo that represents one of your deepest dreams or hidden desires. This kind of design is completely subjective, and you can decide whether you want to make your art work an obvious representation, or cloak the meaning in symbolism only you can understand. Aquamarine is the traditional gemstone associated with Pisces. Perhaps you'd like a tat that features your sign's name resting on a bed of these gorgeous gems? You might also choose to imbed your fish in the center of a faceted aquamarine jewel. Sea green is the natural color choice for most Pisces tattoos. You can have your design inked in monotone, or use this color throughout the work to create continuity between the individual design elements. Pisces is associated with several types of flowers and plant life. If you'd like a tattoo that symbolizes your sign, but isn't obvious to the rest of the world, you might choose a design that incorporates one of the following plants.